WARNING! There are spoilers ahead. You don’t want to read this if you haven’t seen INFINITY WAR yet. Move along….go read my spoiler free post and come back later. I saw AVENGERS: INFINITY WAR opening night and again this weekend. With so many amazing scenes and quotes, it’s hard to choose! This has been tough to write! I have to keep stopping because it’s so emotional! Thankfully there’s comedy thrown in here too which saves us from being completely devastated! These are some of what I think are the best scenes and best quotes from INFINITY WAR. The very first scene of INFINITY WAR takes you on an emotional rollercoaster. If you cut back to the end scene in THOR: RAGNAROK where the huge space ship arrives in front of the Asgardians ship and fast forward a few minutes, you get the opening scene of INFINITY WAR. During INFINITY WAR, we find out that Thanos has just destroyed half the Asgardians. (Thor says this.) Note that. Half. When I mentioned that line to my daughter, she said maybe Thor meant that half of them were already gone because of Hela, and Thanos just destroyed the other half. I’m not so sure. I think there had to be escape ships (think lifeboats) on their ship. Remember Korg’s question to Loki? “Hey, man. 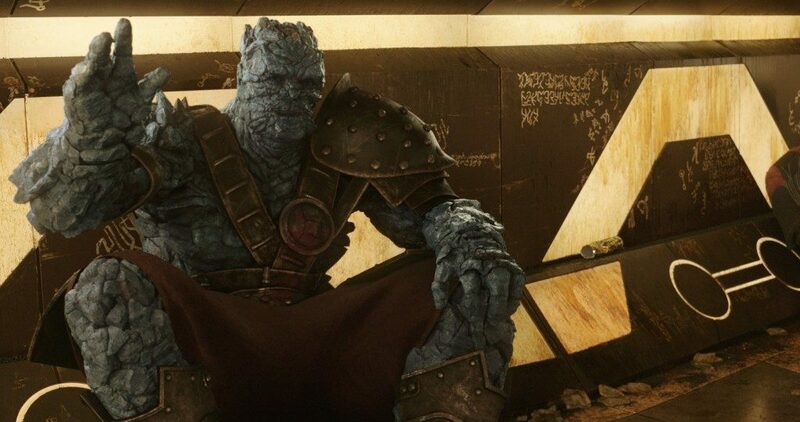 I’m Korg. We’re gonna get outta here on that big spaceship. Wanna come?” So, Loki is still on the big spaceship, but where are Korg and Miek? Where is Valkyrie? I’m hoping that they somehow escaped. Back to the big spaceship….Thanos is there looking for the Space Stone. Thor doesn’t even know that Loki has it, so he tells Thanos it was destroyed along with his home. But going back to THOR: RAGNAROK again, we know that Loki got it out and has it in his possession. We have to watch Heimdall be killed. Horrible. Heimdall has kept watch on Thor his entire life. He’s always known where he is. No more. And, you know what I’m going to say, seeing Loki have the life choked from him. Loki. Our favorite villain. The only family Thor had left. This scene was awful. I also loved Thor calling Rocket “rabbit” the entire movie. It was so funny because Rocket just kind of resolved himself to it and LET Thor call him rabbit. Like that would EVER happen with anyone else! 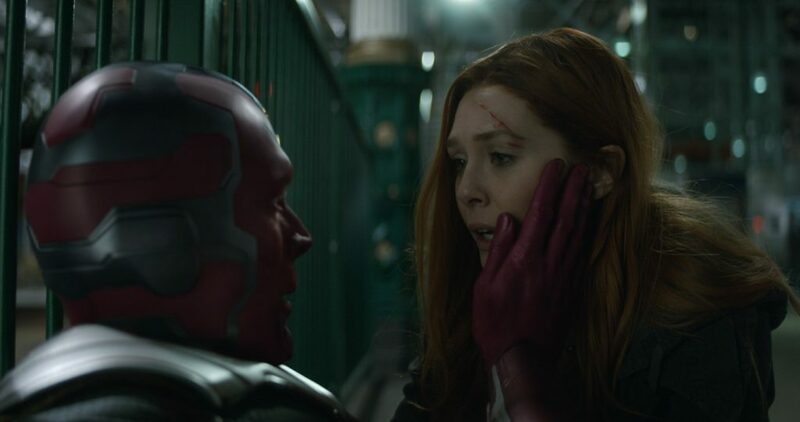 Okay, now this is more than one “scene” but I love ALL the scenes with Wanda and Vision in INFINITY WAR They are finally able to be together. Vision has evolved so much that he is basically human. It’s obvious that they love one another, and losing someone you love is awful. They’re so happy then all hell breaks loose for them. Thanos is coming, and Wanda is the only one who can keep him from the Mind Stone. During their scenes, more of the best quotes from INFINITY WAR come in. Banner tells Natasha, Steve, Wanda, Vision, and Rhodey that Thanos isn’t going to stop until he has Vision’s Mind Stone. Vision tells them the stone will have to be destroyed, not just protected. Wanda says, “That’s too high a price.” And Vision replies, “Only you have the power to pay it.” He knows. When Wanda realizes she is going to have to kill Vision, she obviously is wrecked. I don’t think I could make the same sacrifice, but this just proves how strong she is. She makes the ultimate sacrifice by destroying the mind stone and Vision with it. Then she has to sit there and watch Thanos undo what she just did. And she has to watch him tear the Mind Stone from Vision’s head while the color just drains from his body. I think the look of peace on her face when Thanos snaps his fingers, and she vanishes in the dust says it all. She’s happy to be going because she can’t live without Vision. By now, I’m sure you’ve heard that this scene was unscripted. 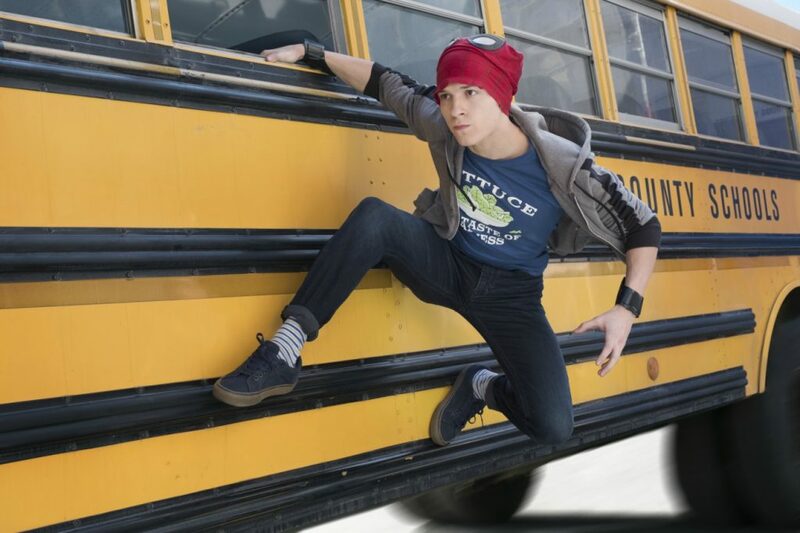 Tom Holland improvised his lines during this scene. The directors told him what was happening to him and told him to go with that. A couple of the best quotes from INFINITY WAR come from this scene. This just shows how well Tom Holland knows his role. I don’t think it could have been any better had it been scripted. Peter says, “I don’t feel so good Mr. Stark….I don’t wanna go.” Of course, they just watched some of the Guardians turn to dust, so they know what’s happening! That scene really crushed me because, in spite of the jokes about Peter being like Tony’s son or as Doctor Strange says, Tony’s ward, he really IS like a son to Tony. I can’t. The Avengers are losing! The dog-like creatures have taken the lead….Enter Thor! You know Thor’s my guy right? 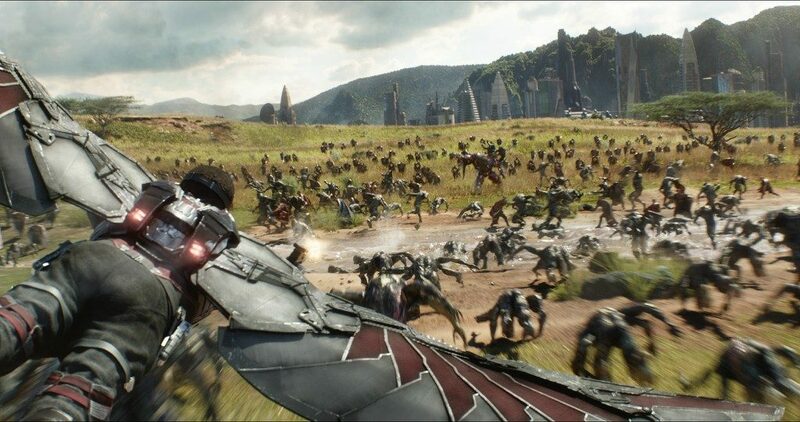 It’s SO fitting that he just lands right in the middle of this battle, wielding Stormbreaker and taking out hundreds of these creatures in one blow. My daughter said the only thing missing from this scene was Immigrant Song! True! That would have been epic. Anyway, another of the best quotes from INFINITY WAR comes with this scene. Cap looks at Thor and says, “New haircut?” Thor replies, “I notice you’ve copied my beard!” HA! We are loving Steve’s beard, by the way. Just look up the memes about the beard. They’ll have you rolling. Then Thor goes on to introduce Groot (you know, Tree)? He says, “This is a friend of mine. Tree.” Groot says to Steve, “I am Groot.” So Steve replies, “I am Steve Rogers.” Everyone in the theatre was cracking up. 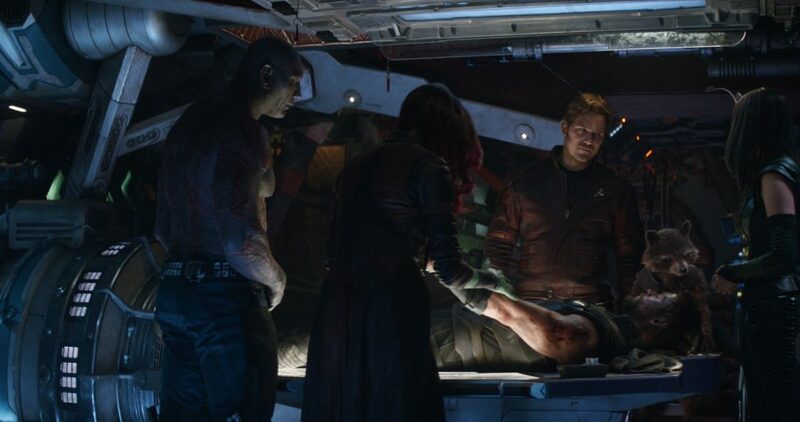 Thanos knows that Gamora has found the Soul Stone, but she has always told him that she never found it. He also knows her one weakness. Her sister, Nebula. Nebula is one of my favorite Marvel characters because of GUARDIANS OF THE GALAXY VOL 2. Her character just evolved so much in that movie. 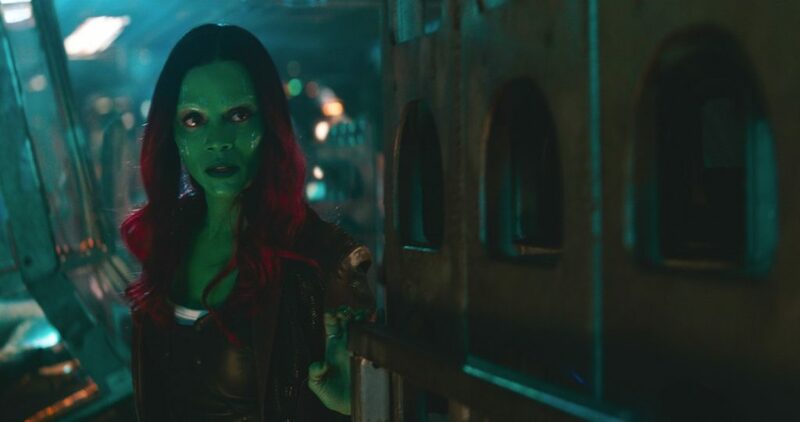 Anyway, when Gamora sees that Thanos has been torturing Nebula, it’s more than she can handle. She tells him the location of the Soul Stone, and they go off together to retrieve it on Vormir. When they get to Vormir, the Stonekeeper, AKA Red Skull, explains to Thanos that the Soul Stone demands a soul for a soul. He’s got to sacrifice the thing he loves most in order to have the Soul Stone. Of course, Gamora laughs at this because she thinks he loves nothing! Wrong. He loves his “Little One.” His conviction (saving half the universe by destroying the other half) is so strong that he makes the ultimate sacrifice. Though he cries when he does it, he still throws Gamora off of the cliff in order to obtain the Soul Stone. There are a lot of theories floating around now. Some are from the comics, others are just what people think will happen in AVENGERS 4. I don’t think Gamora is dead. I think since Thanos had to trade a soul for a soul, her soul is still somewhere. Possibly in the stone. I can’t wait to find out! There are so many great scenes and quotes in this movie, that I could go on and on. I won’t. I want to hear what your favorite parts are! Which quotes do you think are the best? Let’s talk about it. 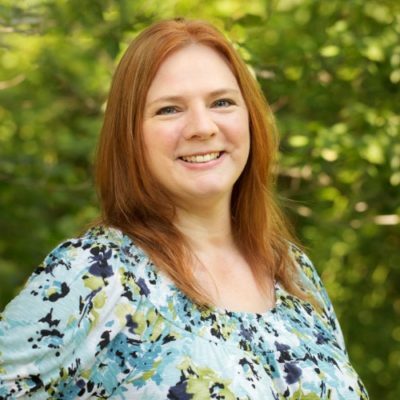 Make sure you’re following my friend’s, Tessa at Mama’s Geeky, YouTube videos. Head to her YouTube channel for tons of Marvel and, of course, INFINITY WAR stuff! 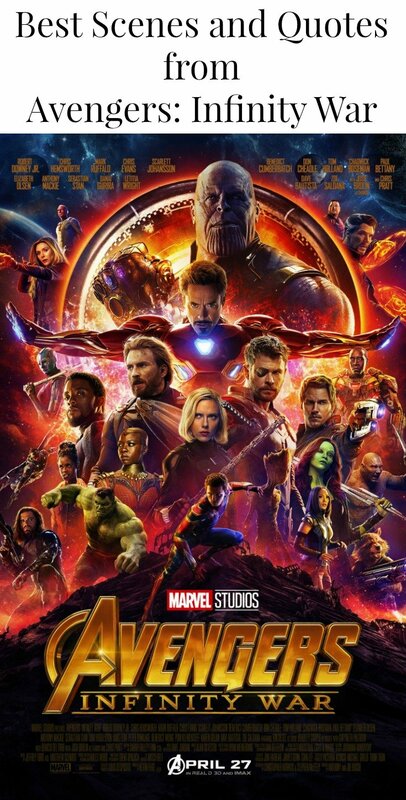 AVENGERS: INFINITY WAR is playing in theatres everywhere.